Asbestos fibers are dangerous because they are so small in size. With microscopic sizes as small as 0.1 micrometers, the respiratory system is unable to filter the fibers and prevent them from entering the body. When inhaled, they can become imbedded in the lungs. While the most severe disease associated with asbestos exposure is mesothelioma, asbestos fibers can cause other diseases as well. If asbestos fibers reach the alveoli (the tiny air sacs in the lungs), they can become embedded. The immune system is triggered by their presence and goes on attack against the asbestos fibers. The asbestos fibers are indestructible. The white blood cells will unsuccessfully try to destroy the asbestos fibers, and this ultimately results in the formation of scar tissue known as fibrosis.1 Fibroid tissue fills the lung sacs making it difficult for the lungs to do their job of transferring oxygen to the blood while filtering out carbon dioxide. Because asbestos fibers can never be destroyed, the immune response to the fibers is continuous as your system tries over and over again to destroy them. Over time, increasingly more scar tissue develops. In most cases, the scar tissue from asbestos is undetectable for years. However, as time passes the scar tissue builds up. Scar tissue is not as flexible as healthy tissue and can hinder the inhalation and exhalation process. Symptoms of asbestosis include difficulties breathing, dry coughs, chest pains, a tight feeling in the chest, bluish skin, and abnormalities to fingers, toes or their nails. Over time, these symptoms will likely become worse as the scar tissue from the asbestos also gets worse. 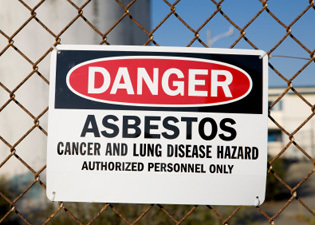 Asbestosis is not cancerous but it can lead to a serious or even fatal respiratory illness. The first step in diagnosing asbestos is usually auscultation – a doctor listening to breathing with the aid of a stethoscope. People with asbestosis will make crackly bubbly sounds known as rales when breathing. A doctor may then confirm a diagnosis of asbestosis with x-rays, CT scans, Gallium lung scans, or pulmonary function tests. There is no cure for asbestosis. However, there are some treatments which can alleviate symptoms and slow progression of the disease. Inhalers (such as those used by asthmatics) or oxygen supplements can make breathing easier. If fluid has built up around the inflamed area of the lung, then surgical drainage, chest percussion, or vibration can aid in fluid removal. In severe cases of asbestosis, a patient may be eligible for a lung transplant. It is also important for people with asbestosis to avoid stimuli which can worsen the condition – such as smoking – and to take precautions against illnesses which impair lung function – such as getting vaccinated against colds and flues. Pleural plaques are similar to asbestosis as they occur from scar tissue. When the asbestos fibers become embedded in the pleura – the lining of the lungs or chest cavity – they trigger an inflammatory immune response. As with asbestosis, this results in the formation of scar tissue (fibrosis). However, unlike asbestosis, pleural plaques calcify over time into hardened masses. Pleural plaques are the most common disease resulting from asbestos exposure. They can form even after sporadic asbestos exposure or low levels of asbestos. That’s how dangerous asbestos is to the human body.2 However, most people with pleural plaques are unaware that they have them. This is because pleural plaques themselves are not known to cause any symptoms at all. In many cases, pleural plaques are detected only when patients go in for chest or lung scans for another illness, such as tuberculosis. Pleural plaques can usually easily be detected with an x-ray but a CT scan is considered the best diagnostic tool for detecting the plaques. There has been some disagreement in the medical community about whether or not pleural plaques themselves cause complications. Some experts believe that the plaques are responsible for respiratory problems such as extreme chest pain. However, other experts believe that any symptoms which are possibly linked to pleural plaques are really the result of another underlying condition, such as asbestosis, which cannot yet be detected. Pleural plaques themselves are not dangerous to one’s health nor will they develop into mesothelioma or other diseases. Unlike some other asbestos-related diseases (such as pleural effusion), pleural plaques are only caused by asbestos. Thus, the presence of pleural plaques confirms that the patient has been exposed to asbestos, which puts him/her at risk of other asbestos diseases. People who have been diagnosed with pleural plaques are advised to undergo regular checkups. Early detection of asbestos diseases can increase the chances of a positive prognosis. Even though mesothelioma is the most notorious form of asbestos cancer, asbestos exposure can also lead to other forms of cancer as well. Of asbestos-related cancers, lung cancer is the most common. According to The Environmental Working Group, asbestos-related lung cancer has caused approximately 4,800 deaths yearly whereas mesothelioma has caused 2,509 deaths. The projections at the current rate is that mortality rates from asbestos exposure will increase over the next decade to 22,000 35,000 mesothelioma deaths.3 Approximately 4% of lung cancer cases in the United States are linked to asbestos exposure or about 5-10 thousand yearly for the past 20 years. Asbestos-related lung cancer can also be linked to other causes as well, such as smoking. Thus, people who have been exposed to asbestos are advised not to smoke. Research suggests that asbestos can also lead to other forms of cancer, such as gastro-intestinal, larynx, and bowel cancers. While the research is not conclusive as to what extent asbestos exposure increases the likelihood of these other cancers, the risk is clear. Pleural thickening is similar to pleural plaques; it occurs when the pleura become irritated and scar tissue develops. The difference between pleural thickening and pleural plaque is that the thickening occurs throughout the pleura whereas plaque occurs in an isolated area. The term “diffuse” means that the scar tissue is widespread throughout the pleura. Pleural thickening is often associated with asbestosis and/or mesothelioma. In many cases, pleural thickening is harmless and does not have any symptoms. However, if the pleural thickening becomes widespread and severe, it can lead to respiratory problems. Symptoms of pleural thickening can include difficulties breathing and chest pain. Pleural thickening can be diagnosed with chest or lung scans, such as an ultrasonography or CT scan. Pleural thickening is not always an asbestos-related disease; it can be linked to many other conditions which cause lung inflammation including: pneumonia, infections, tuberculosis, tumors, blood clots in the lungs, drug use, and lupus, amongst others. When doctors diagnose pleural thickening, they will analyze its thickness and shape. Thick, unevenly-shaped tissue can indicate that the pleural thickening is a result of malignant cancer. 2 Orlowski, E., Pairon, J. C., Ameille, J., Janson, X., Iwatsubo, Y., Dufour, G., Bignon, J. and Brochard, P. (1994), Pleural plaques, asbestos exposure, and asbestos bodies in bronchoalveolar lavage fluid. American Journal of Industrial Medicine, 26: 349–358. doi: 10.1002/ajim.4700260308.